Explanation: What are those colourful arcs in the sky? Like rainbows that are caused by rain, arcs of sunlight broken up into component colours can also result when ice crystals floating in Earth's atmosphere act together as a gigantic prism. The top colour arc is more typical as it is part of the 22 degree halo surrounding the Sun when hexagonal ice crystals refract sunlight between two of the six sides. More unusual, though, is the bottom colour arc. Sometimes called a fire rainbow, this circumhorizon arc is also created by ice, not fire nor even rain. Here, a series of horizontal, thin, flat ice crystals in high cirrus clouds refract sunlight between the top and bottom faces toward the observer. These arcs only occur when the Sun is higher than 58 degrees above the horizon. 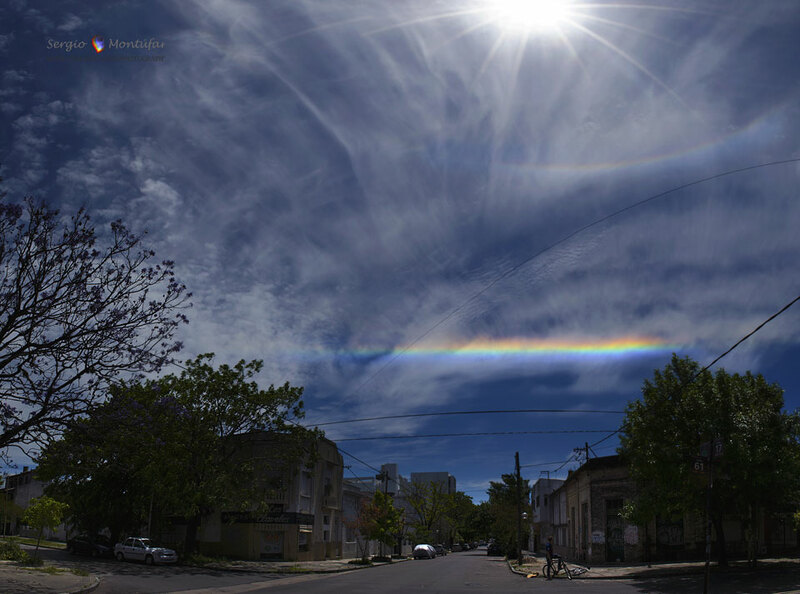 The featured sky occurred to the northwest in the early afternoon last month over a street Diagonal of La Plata City, Buenos Aires, Argentina.